I don't seem to be able to come up with something using live templates. 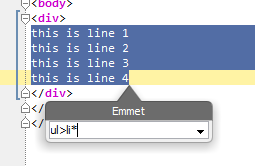 That can only sorround either the first line, or all lines as a single <li></li> item. Is there a way to do this? Use Emmet (previously known as Zen Coding) for this. Thank you! The link to the abbrev section is helpful!